When Is It Acceptable To Take The Elevator? Let’s say that you live in a place where you’ve got to walk a mile or so, then take a train, and climb up and down a maze of stairs in the stations that house those trains, in order to get to work every day. Let’s say that you work on the third floor of an office building that has 18 occupied floors. Let’s say that you got to work after “peak hours”—that is, somewhere after the morning rush, but before the lunch-break exodus at noon. 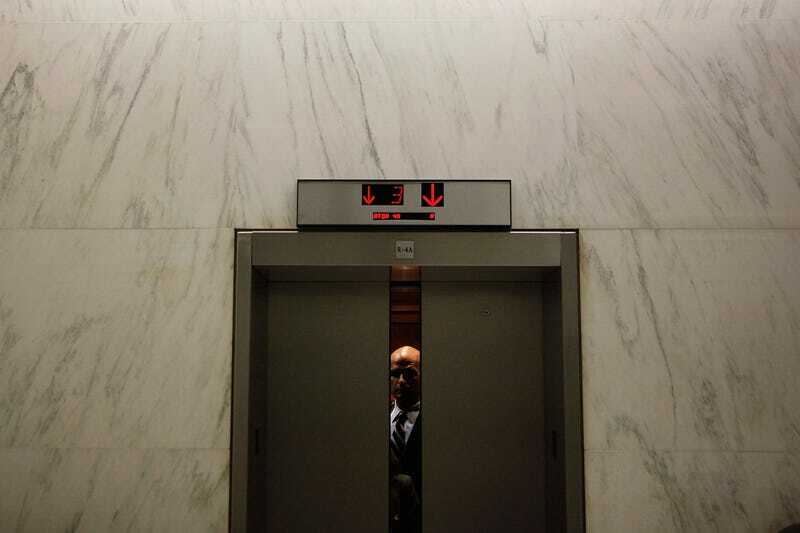 Let’s say that one of the building’s four elevators dings as you’re headed to the stairwell. Do you backtrack and hop on for a short ride, or let it go? You’re only going up to the third floor, after all. There’s a certain shame that comes with taking the elevator up the equivalent of two flights of stairs. Some will say that there’s even shame in taking it up three flights of stairs, to the fourth floor, which is a clear gray area in terms of exercising elevator privilege. (A predictable contrarian at Deadspin suggested that one should not take the elevator to go up to any floor lower than the sixth.) It implies laziness, and a lack of shame with regards to that laziness. How are the strangers around you to know that you’re only taking the elevator because you’ve been wearing heels for the last five days, and don’t you deserve a little break? Would you have waited for an elevator if there wasn’t one open and willing to offer a moment of escape from the cruel world that surrounds you? Maybe ... and what of it?! As it would happen, I had asked Hamilton about it earlier. He said he “likes to mix it up.” Today he took the elevator up to the third floor, and so did I. No people were harmed, and we both look and feel great. Really, what are the rules for taking the elevator? I don’t mind them so long as my taking the elevator up doesn’t bring you down. Contact the author at puja@deadspin.com. Image via Getty.